Upon booting up Driveclub VR, I couldn’t get over how ugly the game looked. PlayStation VR’s low fidelity made the game look like a bit of a mess with the world looking a bit choppy and muddied. Since it’s a port of existing assets, ones that were meant to be displayed on a television, it isn’t a surprise that it doesn’t look great, but it still threw me off. While not Forza Horizon 3 in terms of looks, Driveclub was a great looking racer in its own right, so I wasn’t expecting to be so disappointed visually. Then I actually raced a few laps, and I totally forgot about how ugly it was. Sure, I noticed the occasional pop-in and things never looked as sharp as they should be, but the focus was purely on the racing. I was able to overlook its rough edges since the racing here is tremendous fun. 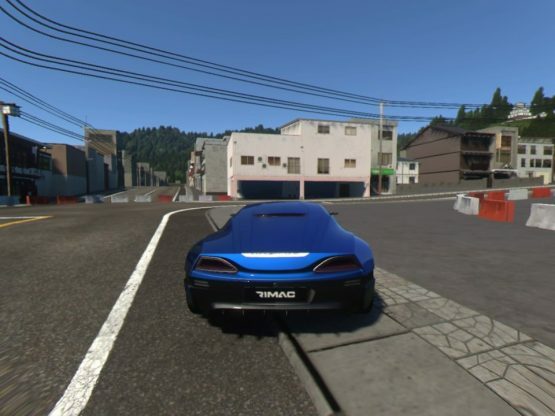 While Driveclub has a deserved bad reputation due to its disastrous broken launch and missing features, it was eventually patched into a fine racing game. The Driveclub Bikes expansion was particularly rad, which makes its disappearance here all the more disappointing. Regardless of minor quibbles, Driveclub VR is able to keep that positive momentum going for the brand, and the addition of virtual reality makes it one of the premier racing games on PlayStation 4. First-person cameras in driving games have always garnered a mixed reaction from players, but it feels absolutely essential in Driveclub VR. Actually being able to sit in the driver’s seat and look around at the car’s interior is a pretty crazy feeling, one that far surpasses merely looking at a stellar model in Gran Turismo. It feels like I was actually there, in the thick of the moment, racing against other opponents. It’s a small thing, but it has a major impact. Being able to actually look at my front and exterior mirrors to see where my opponents were, added a new sense of immersion to the action. It made going around every corner all the more satisfying, and made every victory feel like even more of an accomplishment. It also managed to deliver quite a scare whenever I would spin out and crash my vehicle. Tracks have also been altered to include some 3D effects that really look great while driving. Several tracks feature cherry blossoms (which is an effect that Mario Kart 7 also used), birds, plastic bags and other objects that help bring the tracks to life. Despite not being a graphical tour de force, Driveclub VR has enough tricks in its sleeves to still be impressive in spots. Despite having such a thrilling new hook to the gameplay, Driveclub VR will still feel very familiar to those who have played the PS4 game. From the menus to the tracks, everything has seemingly been kept intact. It doesn’t have nearly the amount of content (Driveclub got a ridiculous amount of DLC), but there are six different locations (ranging from Japan to Scotland) and 162 stars to collect in its campaign. The game’s progression is identical to the original game, as players compete in races, time trials and drift events in order to gain stars. This in turn unlocks even more events, and the cycle repeats until the player has played dozens of different challenges. It’s not the greatest way to structure a career, but there’s a nice difficulty scale and I never found the events to be boring. 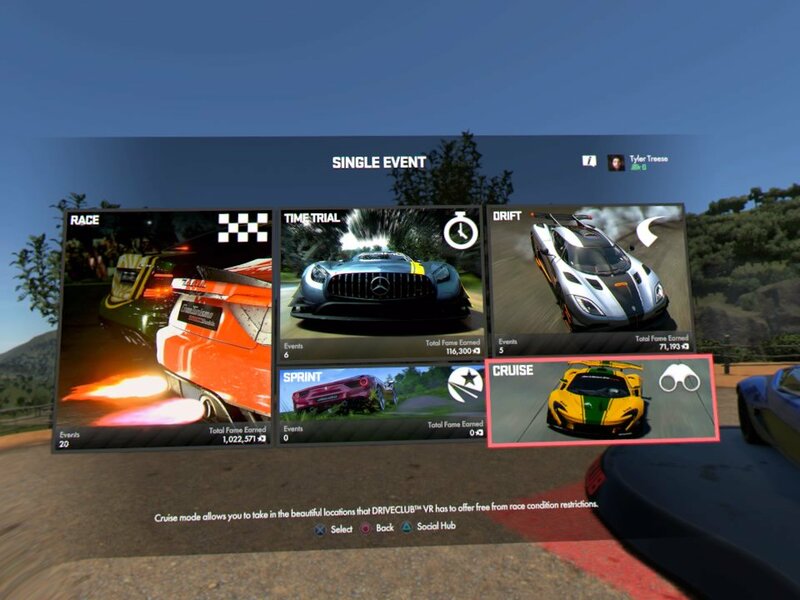 All of the social hooks that Driveclub was initially sold upon are also present. I was still trying to outperform other players when drifting around corners, and there are still clubs that players can join. I could also send out challenges to players on my friends list. Multiplayer also makes a return, as players can compete in the same race types as the campaign, and my online experience went smoothly. The only real new addition to the feature set is a Cruise mode that allows players to just drive around tracks aimlessly. There are several trophies tied to spotting different objects in the environment (such as scarecrows and gnomes), so there’s at least one reason to check out this mode. All it really did was make me realize that Driveclub VR has a whole lot of invisible walls that I never noticed while staying on the racetrack. It is worth noting that there have been reports of Driveclub VR making players motion sick. While I never had any issues playing, that might not be the same for others. I’d recommend checking out the demo of the game before purchasing, but I can only go off of my own experience. Driveclub VR isn’t pretty, but it’s still some of the best racing found on PlayStation 4. I’ve never found drifting around corners to be this satisfying, and having to actually look at my mirrors helped fool me into thinking I was actually behind the wheel. If this is the end for Driveclub, it at least gets to leave on a high note. Review code for Driveclub VR provided by publisher. Reviewed on PlayStation 4. For more information on scoring, please read our Review Policy here.